Share Your any Internet Connection very easily and quick!!!! All thanks to Manash for giving me this liberty to rampage his blog. Okay, so my last month was quite frustrating…I could not find a way to share my broadband connection with my new Android Phone-Motorola MB511(AT&T), for my initial MotoBlur account setup process and staidly there was no freaking way to bypass it :((. If only I had a wireless router :(( !!!. Nevertheless a few researches on Google revealed the fact that we can actually use a Wi-Fi card as a virtual wireless router under Windows 7!! :)). Literally, there are many softwares available on the net that makes this simple task even simpler but then we all love the command prompt(the geek’s way).. don’t we ???. Here’s how we do it using the command prompt…. *where “TechDiarywifi” is the name of the wi-fi Access Point and “1234567890” is the passkey of the wifi AP. *Now open Control Panel>Network and Internet> Network Connections and you will find a new Microsoft Virtual WiFi Miniport Adapter (Wireless Network Connection”X”) where “X” is a number that will depend on the number of network connections that you have. In my case it is “2” & hence Wireless Network Connection 2. 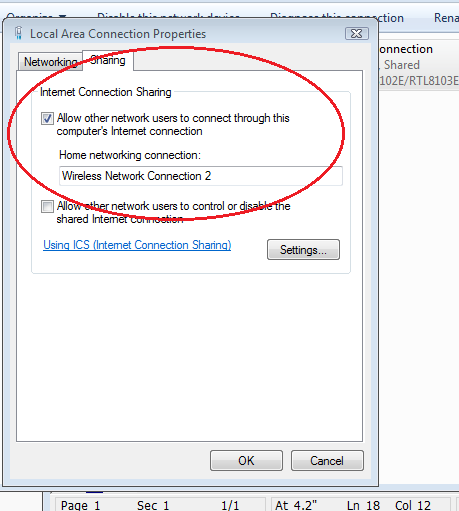 *For sharing your broadband connection over this hosted network click on your Broadband LAN Connection properties > Click on “Sharing” tab at the top. Under Internet Connection sharing, check the option “Allow other users to connect through this computer’s internet connection”. **Sharing your internet connection is now easy. Just turn on the Wi-Fi on your android phone/tablet/lappy/netbook (generally the client device from where you want to connect to the “TechDiarywifi” network that you have created). Give it a few minutes before it detects your Wi-Fi network and then enter your password to login. Using this process you can share any internet connection over Wi-Fi !! ( even you’r USB dongle’s internet connection via your Laptop Wi-Fi !! ).